My very best friend used to make me this delicious treat. Even now whenever I make this, I think of her and her fabulousness. She had the recipe on a little index card in her recipe book. I copied it some time ago and lost it in my many travels since college. It’s a Betty Crocker recipe from some old cook book but I’ve never been able to find the true reference for it (if you do, let me know!) I finally found it on some obscure website that I’ve never been able to find again. Luckily I printed it out and cherish that printed copy. Now I’m blogging it so that I’ll always know where to find it. 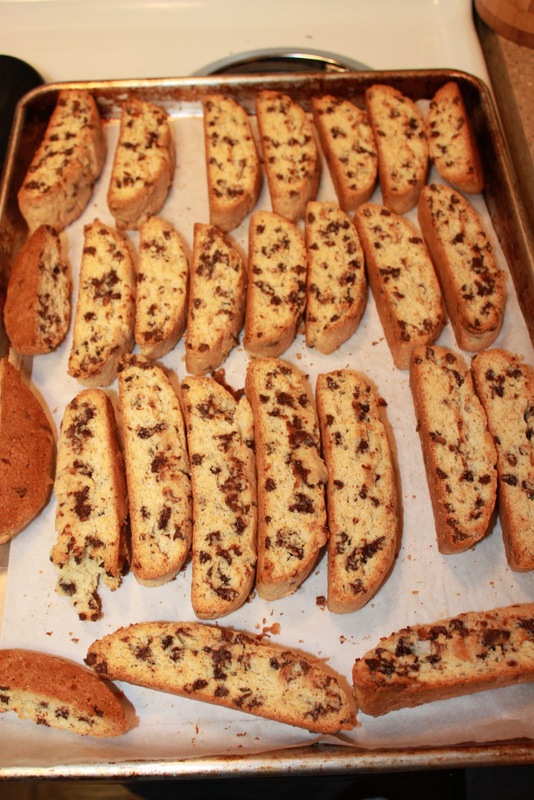 I’m generally not a huge biscotti fan. Sure it’s great to dunk in coffee… but really, without the coffee I'm afraid I'll chip a tooth! This biscotti is in a whole different category. 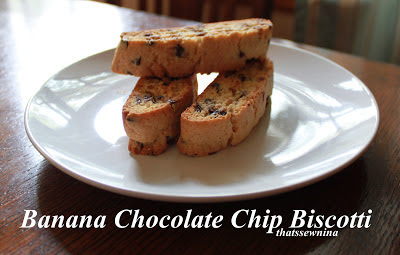 Don’t get me wrong, it’s still crunchy like biscotti should be but that little touch of banana gives it a soft and crumbly consistency that won’t break any teeth. Try it out! It’ll make you a lover of the crunchy cookie variety. Preheat oven to 350 degrees. Cream together butter and sugar. Mash up your banana in a separate bowl. Add bananas, egg and vanilla to the butter and sugar mixture. Sift (or stir) together the flour and baking powder then add to the wet ingredients. Fold in the miniature chocolate chips. Cover a large baking sheet with parchment paper. Butter up those beautiful hands of yours. It's about to get sticky. Divide your dough in two. Create two logs that are about 3”x10”. Side by side on the pan is fine. They don’t rise a whole lot so just a few inches apart is fine. Bake for 25 minutes or until a toothpick inserted in the middle comes out clean. Let the logs cool on the pan for 15 minutes or so. Transfer the logs to a cutting board and cut into 1 inch slices .Place the slices back on your parchment papered baking sheet. Bake for another 10-12 minutes until just slightly browned. Take them out of the oven, let them cool for 5-10 minutes until you can touch them. Flip them onto the other side and bake for another 10 minutes. Keep an eye on them this second time around to make sure they don’t get too dark. Summon all of your willpower and let them cool completely. Cooling them will harden them up. Remember that they’re crumbly so messing with them too soon with result in a crumbly mess and ugly, broken cookies. …. but not too much. These babies are addicting. Amen, sister! Forever one of my favorite things!